The music of West Africa has influenced the artistic expression of Americans for generations. By exposing students to the beauty of West African music we are giving them a connection to a cultural history that has existed since the beginning of humanity. Wona Womalan's Artistic Director, Fode Moussa Camara, conducts residencies for elementary, middle, high school and college level students. His hands-on teaching style enables each student to learn on authentic instruments handmade in the country of Guinea. Fode will also bring a dancer for those who want to include West African dance as a part of a residency. During a drum residency Fode will introduce students to the fundamentals and stylistic intricacies of West African drumming through interactive instruction. Each student will play an authentic instrument including the sangban, kenkeni, doundoun, kryin, Guinea bell and djembe. Fode will inspire an appreciation for the cultural histories of West African drumming and how the rhythms are used in community life. The geographies of West Africa and their relationship to West African musical traditions will be explained. During dance residencies students will be introduced to West African dance through interactive instruction. Through the various dances taught students will learn the nuances of African movement and how they are reminiscent of life in West Africa. Fode’s residency program culminates in a school performance in which the students demonstrate what they have learned to their peers, parents or care givers and teachers. Wona Womalan can design a residency to suit your students. Drum residencies can be combined with dance residencies. All residencies can include a performance by Fode Moussa Camara and/or Wona Womalan. Please complete an online request or contact us to inquire about residency rates. 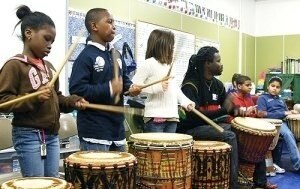 African drummer Fode Camara (center) shows Newington Elementary students from Ms. Debbie Polk’s fourth grade class how to play Guinean rhythms.